FootJoy made the newest version of their DryJoys Next Advancement golf shoe - the D.N.A Helix - with power and stability in mind. The D.N.A Helix went through arduous testing by tour players from around the world. Their feedback led to a complete redesign resulting in a players shoe that delivers more platform stability - especially in the heel - with much greater comfort and flexibility. FootJoy's new NitroThin 3.0 TPU (thermoplastic polyurethane) outsole delivers 38% more stability than last year's model. The fit-bed was redesigned to provide more lateral stability while FootJoy's new 3D Foam Collar holds the players foot in place. FootJoy warrants that the D.N.A. Helix golf shoe will be 100% waterproof in normal use for two years (U.S. Warranty). Stop by North Iowa Golf and try on a pair today! FootJoy's Pro/SL golf shoe is a huge hit with tour players and amateurs alike for one reason: they're some of the most comfortable spikeless golf shoes you could put on your feet! Reviewers report there was no break-in required, no blisters, and no discomfort over several months of trials. The Pro/SL is one of the few spikeless golf shoes on the market that feels and behaves like a real golf shoe. Testers report stability is just as good as replacement spike golf shoes. Testers also report that the Pro/SL has plenty of room in the rounded toe and the narrow heel holds the foot in place without causing blisters. FootJoy warrants the Pro/SL golf shoe will be 100% waterproof in normal use for two years (U.S. Warranty). FootJoy's Contour golf shoes are designed to be one of the lightest, softest shoes in golf. It all starts with soft premium full grain leather for outstanding waterproof comfort, breathability, and durability. FJ warrants the Contour golf shoe will be 100% waterproof in normal use for two years (U.S. Warranty). The Contour features a full rounded toe character, full across forefoot, standard instep and heel. The bottom has been contoured to match the shape of the foot very closely. Contour's lightweight cushioned fit-bed gives you fantastic underfoot comfort and heel support. The fit-bed ensures a comfortable underfoot environment by dampening shock while walking. 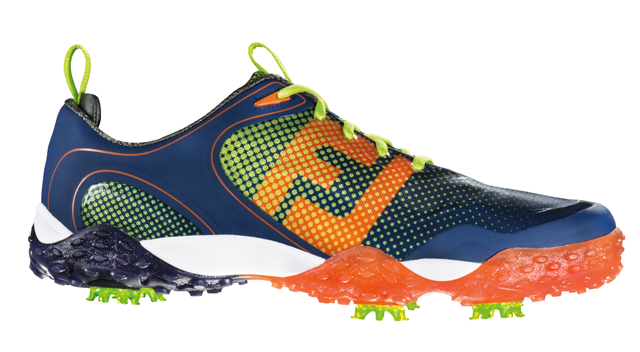 FootJoy's designers built the enJoy women's golf shoe with comfort in mind! They started with UberLite™ foam cushioning and molded rubber traction inserts for maximum comfort and traction. Then they made them easy to clean and machine washable to ensure fresh, clean footwear. Contour's lightweight SoftLite engineered mesh offers extremely light comfort and durability. And Contour will keep you odor free with its EverFresh organic odor-control linings. FootJoy's FreeStyle men's golf shoes are engineered to give you great traction and ground contact but still allow your feet to roll through your shot. With FreeStyle golf shoes, you'll get complete support with FootJoy's InnerSok® system. InnerSok® gives you an achilles pad for additional support and comfort in the heel counter, and the Tongue-Lok® instep grip ensures additional slip-resistant fit in a key location under the tongue. You'll also get extreme cushioning with the Xtra-Thick shock absorbing Fitbed with HeelLok® for outstanding comfort and slip-resistance in the heel. And you'll enjoy superior traction from FootJoy's F.R.O.G.S. outsole. F.R.O.G.S. is FootJoy's Revolutionary Outsole Grip System which is constructed with FootJoy's SoftMax® molded translucent rubber for soft cushioning and complete mobility. To cap it off, FreeStyle's Pulsar cleats will give you dynamic cushioning and green-friendly traction from tee to green. FootJoy's GreenJoy golf shoes offer great traction at an economical price. GreenJoy golf shoes are built on the Austin Last to give you a full rounded toe character, full fit across the forefoot, and standard instep and heel. The lightweight cushioned fit-bed will give you great underfoot comfort and heel support and dampen shock while you're walking. GreenJoy's are made of synthetic leather or PVC. It's a soft, easy care material that gives you the look and feel of leather. To round the GreenJoy off, FootJoy made the shoes with a DuraMax rubber outsole using a proprietary compound that provides turf-gripping performance and durability. FootJoy's HyperFlex golf shoes feature innovative materials and deliver lightweight support and cushioning. FootJoy's high performance FlexGrid® 2.0 material is mixed with a soft, comfortable athletic mesh for outstanding retention properties. Fine-Tuned Foam 2.0 provides underfoot comfort and soft cushioning without compromising lateral support and stability. Tornado cleats by Softspikes and HyperFlex' Optimized Performance Stabilizer secure your feet throughout the swing to provide maximum support, comfort and fit. FootJoy's SuperLite golf shoes are one of the lightest shoes in the game. The SuperLite has a full rounded toe character, a full fit across the forefoot, and a standard instep and heel. The lightweight cushioned fit-bed provides excellent underfoot comfort and heel support and dampens shock from tee to green. Fine Tuned Foam (FTF) outsoles provide outstanding cushioning for superior comfort and lightweight performance. FJ warrants SuperLite golf shoes will be waterproof in normal use for one year (U.S. Warranty). FootJoy's GreenJoy golf sandals are made from durable synthetic leather or PVC, which is a soft, easy care material that offers the look and feel of leather. GreenJoy Sandals have a DuraMax rubber outsole made of a proprietary compound that provides turf-gripping performance and durability. The Newport design gives you a full oblique toe character, is full across the forefoot, and has a full instep and standard heel. FootJoy sandals come with adjustable Velcro fit straps for a customized fit. North Iowa Golf either stocks or will order FootJoy Golf Shoes in all popular models. Stop by North Iowa Golf and check out our huge selection or Call for Pricing today!